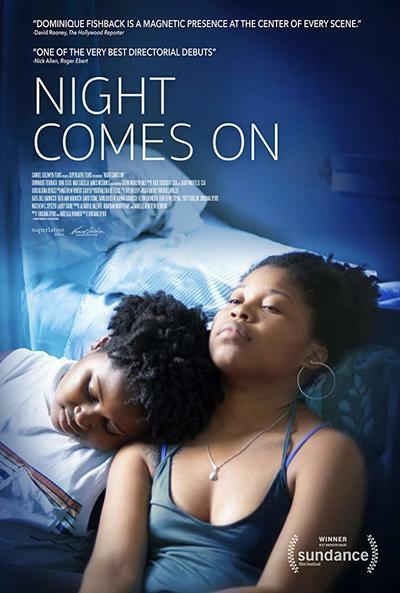 "Night Comes On" is built around the numbed, distant stare of its heroine, Angel (Dominique Fishback), a teenage girl who wants to kill her father for murdering her mother. The story begins in relative tranquility, with Angel remembering what it was like when her parents were both alive and still together; then we move into the present day, when Angel has just been released from prison as a juvenile. Although we don't immediately learn all the details, we figure out from context that she entered the foster care system after the tragedy and was involved in crimes, including firearms possession, which eventually landed her behind bars. After her release, Angel immediately tries to arm herself again. This debut feature from co-writer/director Jordana Spiro and co-writer Angelica Nwandu (drawing partly on the latter's own experience) does such a good job of conveying a free-floating feeling of hopelessness that you can imagine many different reasons for this even though you haven't gotten all the details yet. It eventually becomes clear that she's driven by a need for revenge, though one of the more surprising things about "Night Comes On" is the way it keeps letting Angel drift from the path she's chosen for herself. The instrument of that diversion is her kid sister Abby (Tatum Marilyn Hall), a wry and thoughtful girl in foster care who seems to have escaped at least some of the damage inflicted on Angel, or maybe is just better at compartmentalizing it. The glimpses we get of Abby’s living conditions—she’s packed into a basement room with other foster children even as her white foster mother’s biological daughter lives upstairs in comfort—hint at the larger context of racism and neglect enfolding this particular story. We are constantly aware that both of these girls are on their own, whether Angel is facing the sleazy father of a former soulmate (Max Casella) from whom she hopes to purchase a gun, or a parole officer (James McDaniel) who frankly tells her that nobody cares about her and she might as well get used to it. But the story avoids situations that might cross the line into exploitation. The movie never entirely convinces us that its heroine has the capacity to kill, although her pain and loss are conveyed with skill by Fishback. Whether this is ultimately a matter of direction, writing, or her performance is not clear. The structure of the story also proves frustrating. The emotions of a child who wants to murder a parent are so powerful that they deserve more thorough and nuanced exploration than the movie permits. As it is, we are building and building to an inevitable confrontation which can only go one of two ways, and it’s hard to shake the feeling that the film might’ve been stronger had it chosen to go on several beats longer. But this is still an unusual and interesting feature that tries to convey the inner state of a non-communicative young woman mainly through reaction shots of her face. That alone is enough to power it beyond any moment to moment difficulties it might have.